Concerns about Europe and the US going into recession and hard-landing of the Chinese economy refuse to go away. In an interview with DCI India correspondent Kunal Bose, CEO of Vedanta Resources Tom Albanese says if recession actually occurs, commodities will be the first to suffer. The commodities sector, according to Albanese, is seen as a canary in a coal mine. Left to him, he doesn’t think a global recession will happen. Albanese was earlier CEO and a board member of Rio Tinto. DCI: Industrial Commodities in general are down over the last few years. Aluminium and iron ore prices though have marginally improved in recent weeks. When do you think the real turnaround in commodities in general will happen? TA: When seen in global perspective, there is a general negative sector sentiment around resources that is almost independent of supply and demand consideration. The reason for that is commodities sector is seen as a canary in a coal mine. There is a lingering concern that global growth is going negative, driven principally by the risk of hard-landing in China. You also have concerns of recession in Europe and the US. Risk perception has, however, lessened over the past six months. Chinese numbers are looking much better than they were six months back. If the world is to fall into a recession, commodities will be the first to suffer. Left to me, I don’t think a global recession will happen. Even then the perception that commodities would lead such a downturn has caused people to be less exposed to the sector than they otherwise would. If you look at the statistics on institutional investors or long-only institutional ownership of commodities, including the mining sector, it’s the lowest in 30 years. The second factor causing negative sentiment is the US dollar remaining the ‘go-to’ currency and it gets stronger against all other currencies. This cannot but have an offsetting effect against resources. Take our own zinc business, where the supply demand characteristics are pretty good. Even then zinc prices dropped from $2,000 to $1,500 a tonne in just six months, on no real fundamentals but on fear of the unknown. Now zinc has recovered over $200 and is beginning to reflect the fundamentals. As the blanket lifts off the sector, people are becoming less and less concerned of the unknown. Let’s consider the supply-demand fundamentals of individual commodities. I do believe each has its unique fundamentals, not in the demand profile but in the supply profile. While the underlying zinc demand for auto galvanizing has slowed down, it isn’t recessionary kind. Then a lot of zinc ore mining capacity has closed in the past six months and no new big zinc mines are coming on stream. So the supply tightness is more evident in zinc than in other commodities. All commodities are doing better than they were three months ago. But they are all worse than they were 12 months ago. The important thing is commodities rerating has begun. DCI: But what about iron ore, the world’s most heavily traded seaborne commodity? TA: As for iron ore, we are pleasantly surprised to see this rebound in prices in the sea-borne market. It’s principally driven by seasonal factors. Margins have improved for Chinese mills. Usually around this time of year, ore prices tend to be stronger. You have a combination of steel mills getting ready to build up stocks ahead of Chinese construction season start and then buying is triggered by cyclones in Australia and difficult weather condition in Brazil. In the first place drop in iron ore prices was overdone. Lots of producers were losing on cash flows. I think ore prices are looking for equilibrium. In the near term, some big producers have capacity expansions under progress. So we have to be ready to mine iron ore preferably at prices lower than today. DCI: Industry’s brave hearts Rio Tinto, BHP and Vale took the position that in no case they would regulate production to keep prices at higher levels which would help smaller producers to survive. They all have excellent economies of scale and even if ore prices fall to $25 a tonne, they will still be making money. Though margins will remain highly squeezed. TA: What’s happening in iron ore is no different from what is happening in other sectors. Smaller producers want bigger ones to reduce their production so that they can make money. You are right there have been quite a bit of expansion in iron ore mining capacity on the basis of continued growth in global Chinese steel production. Now it has slowed and that’s having an effect on the current market environment. As for iron ore expansion, once it’s complete the flywheel starts spinning. It just goes on and on. You can’t stop it. It will be value-destructive to stop that flywheel. DCI: Where will iron ore prices stabilize? TA: In this low iron ore price market, small players will tend to leave the supply base, particularly in China. Then a lot less capital is spent in new mines. Fringe businesses in China and West Africa have been hit particularly hard. I am familiar with the West African supply side and miners there are devastated at these prices. You have seen a supply side reaction in China. It has caused Chinese steelmakers to rely more on seaborne supply; possibly the upcoming restructuring in the Chinese steel sector will further that. Coastal mills relying on imported ore, armed with modern, less labour-intensive processes and strategically placed to export steel products will be spared the pains of restructuring unlike the old inland units. You will see overall Chinese steel growth slowing and therefore, the country’s iron ore consumption. Chinese domestic miners will take the hit most. On percentage terms, mills there will be using a higher percentage of ore from seaborne market. 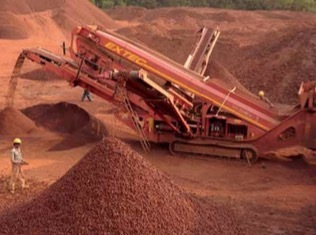 DCI: In 2009/10, India’s iron ore exports amounted to nearly 118mt (million tonnes) on production of 219mt. But then because of ill-advised high export duty and mines closure on court orders, the country’s overseas ore sales trailed off to 6.12mt in 2014/15. Your Vedanta is a major ore producer in India. Your comments. TA: New Australian producers then picked up the slot India vacated. So it’s not just that India lost the business but India permanently lost the market share. Look at some of the new players, Fortescue for example, their rise in production capacity almost nearly equalled the decline in India’s export capacity. I’m aware of Indian steel industry campaign against ore exports of all kinds, lumps and fines irrespective of their iron (Fe) content. My view is that India is not short of iron ore. The industry is short on capital. DCI: Capital should preferably come from outside, since India is short of that. TA: Capital origin is not important. If there is an investment opportunity it will come from overseas or it will originate here. I have seen by way of a lot of experience that geological formations in Goa, Karnataka and Orissa are equivalent to those in Australia and West Africa. Geological formations are the same, prospective resources are the same and the constraints in India are basically man-made. The basic constraint is that lease sizes are quite small and so you are not able to look at the holistic geological formations, like in Australia. That is a legacy factor which is hard to work through. Geological formations in Australia are largely in remote areas with no population. But in India they are in communities settled locations. The mindset in India is for smaller domestic scale mines, very similar to what was found in Australia back in the 1960s. It wasn’t till the 1970s the recognition came that Japanese capital, in conjunction with Australian capital, could develop very large resources. It went well beyond the then prevalent view of protecting Australian resource for Australian steel, to one where it became the single biggest industry in the country. In many ways, if you look at the geological endowment in India, I would say if it was difficult for Australia it is going to be difficult for India. The small leases, generally more populated areas and lack of infrastructure are going to make it all the more difficult for India. It took 40–50 years for the infrastructure to develop in Australia. DCI: But infrastructure in Australia was developed by the big miners largely. TA: Let’s say by private capital. But it didn’t happen overnight; it took many decades to evolve. Infrastructure will not be a constraint if private and public capital combines. You have to have a vision for India. I have a vision for what iron ore could do for India. But that’s not realizable overnight. It is difficult to basically look at large scale operations and then to create the social licence due to the presence of communities in the area and also because of infrastructure deficit. Infrastructure could be developed through public private partnership (PPP) model. It should be one step at a time. But the Indian steel industry must not be fearful of losing its geological endowment. What they need to fear is that it doesn’t continue to grow on Australian imports. DCI: Believers in free trade will not care whether Indian steel mills are using local iron ore or ore of Australia origin as long as the prices and quality are right. TA: I think I am a free trade person myself. I do want to say that the steel industry always had a special place with governments. If you look at all major wars of the past 300 years, they weren’t won by countries with best armies; they were won by countries with the best steel industry. Ultimately when you think about policymaking you consider the government’s responsibility to provide jobs, home and also defend borders. The steel industry always had a special place with policymakers. I respect that. If you think like that, India should have its own indigenous steel industry. I also believe that the iron ore resource endowment is so large it won’t go away. If you look at what happened in Brazil, when people thought that their ore resource would only last 20–30 years; it is now being evaluated to be good for 100–200 years. I shall say 200 years from now geologists will still find more ore there and in many other places. I know in Pilbara (Australia) or Brazil or West Africa, the material that goes in waste dumps is abandoned iron ore formation with Fe level at 40%. DCI: Do you think after what New Delhi has done with export duty in the 2016/17 budget, Goan iron ore exports will come back to its past level? TA: We are not working in a $100 a tonne price environment for iron ore. Now we are at $40–50. From our perspective, we think that the government made the right decision to eliminate the duty for low grade iron ore exports. This was, however, not desired by the Indian steel sector. Moreover, Goan iron ore is not best configured in terms of its location. To get the mines in Goa back to where they were before closure will call for a lot of capital investment. So you are back to the point that the industry is short of capital not short of resources. We at Vedanta are ramping up our business, so also other operators. We should be able to make some money at current prices, but not a lot. The key is to get the flywheel going. DCI: Whatever ore you produce in Goa has to be exported, since the domestic market is not there for that kind of ore. But for you to export you need China. But has China got the same kind of interest in Goan ore like it was before suspension of mining? TA: Today we can sell every tonne of iron ore we produce. That is also our plan and most of the iron ore goes to the Chinese steel sector. We recognize that we have to now rebuild our market share even if our material is of lower grade, as opposed to other grades in the market. We do have some advantages in our iron ore. The Goan quality has low phosphorous than much of the newer Australian product. So we are marketing our product by encouraging Chinese steel mills to go for blending and thereby bring down phosphorous levels they may have through Australian ore.Vedanta mostly produces fines in Goa. But we also have some plus 58% Fe product which doesn’t make sense for us to export owing to the 30% duty. We have our local market and we also have value-added business. We have been expanding that business in Goa.